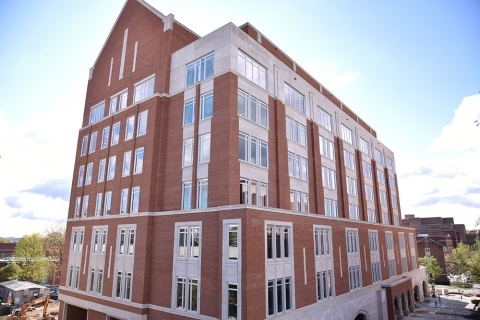 The newly completed Strong Hall is a 268,000-square-foot academic science structure that houses Anthropology and Earth & Planetary Sciences departments, General Biology and Chemistry teaching labs, as well as state-of-the-art teaching spaces and lecture halls. Construction at Strong Hall started in Spring 2014 and finished in Summer 2017. A dedication ceremony was held on Friday, September 8th. The building maintained historic details from the 1926 Sophronia Strong Residence Hall and included a total restoration of the 19th-Century Queen Ann Style Cowan Cottage at the corner of the site. Faculty and staff at the Department of Chemistry are quite excited about the impacts of this new building and the 14,000-square-foot new lab space could bring to chemistry education.